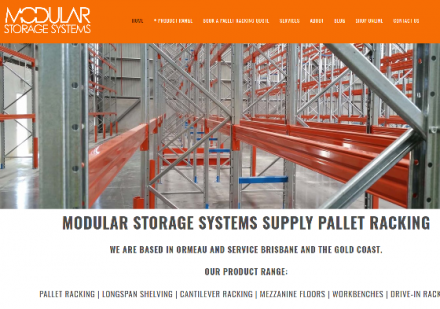 Modular Storage Systems - Searching for quality pallet racking Brisbane? Searching for quality pallet racking Brisbane? Modular Storage Systems are your local pallet racking specialists, offering a wide range of warehousing storage solutions including cantilever racking, longspan shelving, mezzanine floors, drive in racking and workbenches. With expert installation available, and stock on hand ready to be delivered, trust Modular Storage Systems for all of your warehouse storage needs. Description: Modular Storage Systems is a Gold Coast and Brisbane trusted Pallet Racking installation companies. We are experts in our field and offer competitive prices, taking a highly personalised approach to each customer and project. Airways Transmanage (Popularity: ): International freight forwarder specializing in the tradeshow and exhibit industry. Bower Green (Popularity: ): Warehousing, haulage, distribution and shipping in the UK. A Logistics services company (Popularity: ): Logistics services including public warehousing, E-commerce and catalog fulfillment. Inbrit Logistics (Popularity: ): UK organisation offering freight forwarding, logistics and commercial storage sectors. North American Service Hub Inc. (Popularity: ): Transport, warehousing, freight broker for all principal cities throughout Canada and the United States. Pyramid Logistics Group: (Popularity: ): Resource for logistics, warehousing, outsourcing and delivery service. Ziegler Group (Popularity: ): An international provider of logistic services and multimodal transport. Transport Logistics, Inc. (Popularity: ): A third party logistics (3PL) company specializing in all forms of freight distribution including retail pool distribution.